In order to organise a national competition without any kind of budget, you need to be a little bit nimble. So when our special guest judge Jackie French informed us recently that she was dealing with complications after knee surgery that may require another round of surgery, we wished Jackie the very best for her recovery and nimbly found a new special guest judge. 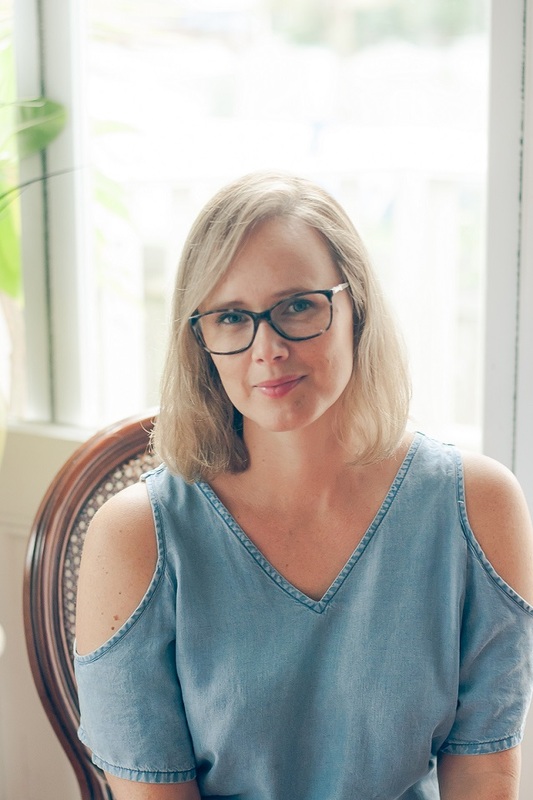 We approached Freelance Journalist Cat Rodie to help us out with the judging (Cat is also proud to be dyslexic, although she still wonders why it has to be such a tricky word to spell!) . Cat responded very quickly with a yes, and she has since judged the four age categories for us (more on that soon). My super hero is three people, my mum, dad and Victoria. Mum helps me with my homework, Victoria's and school, and when I need a lucky charm she is there. My dad helps me with cheering me up and saying how lucky I am. When he was a kid he got none help with work, so he helps me as much as he can and he is dyslexic too. And the last of all is Victoria, she is my tutor she teaches me new things after the class and before. She has so much niceness in her, she is a 5 out of 5. She taught me running writing and more. My dyslexia hero is my mummy. She helps me through all of my spelling mistakes and all the things that go wrong but she also compliments me and encourages me on all of the things I do well, like drawing and writing. 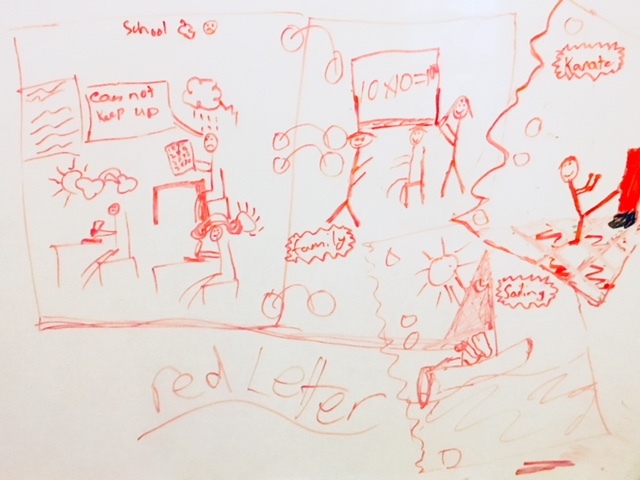 I chose to draw myself surrounded by letters that represent the spelling mistakes that I make. It is like drowning because everyone else seems to be able to spell so easily except me. 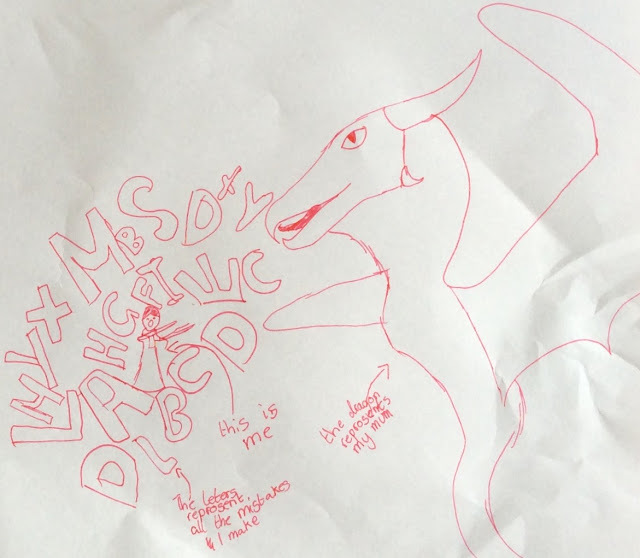 The dragon represents my mummy saving me from the words. She helps me by teaching me how to spell the words I get wrong and by making me split words into syllables, which help me to spell the words easily. Mummy got me an iPad and showed me how to use assistive technology to write all of my novels. I write a lot, lot, lot, lot, lot! It would be harder if Mummy didn't help me and I would probably give up on my writing. The dragon has powers over life and death. Where you cannot reach, the dragon can. And it does this because of love. The power pushes evil away with the power of the heart. I’ve been working really hard to find a way of expressing this sentiment without it sounding like a cliche but the fact is I can’t decide who my ‘dyslexia champion’ is. I have too many. 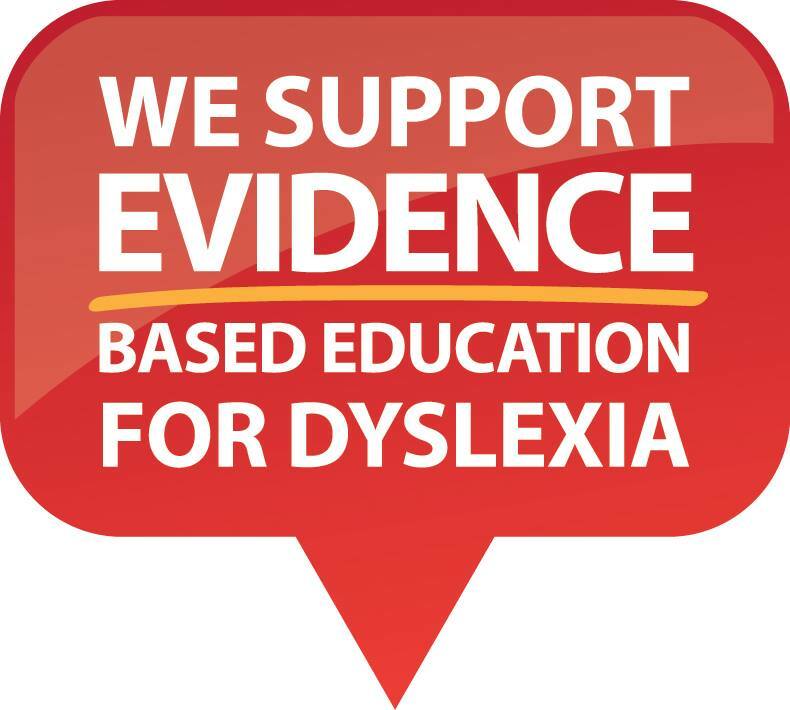 So I am going to group them all together under the banner of Code Read Dyslexia Network; the newly created NFP that burst to life on Saturday October 14th 2017 with a TV appearance on Channel 9. When you scratch the surface of this new group you will find its slightly battered and bruised heart : a band of fiery women (mostly mothers of dyslexic children) and a sometimes grumpy but eternally passionate old bloke. These people who are bound by the same heartbreak, the same battles and the same joys, have become my safe harbour. They are my inspiration, my confidantes, my friends. They are, all at once, a soft place to fall, a lightning rod to galvanise me into action and a sounding board for all the fun, frustrations and fears this life with dyslexia brings. I don’t know what I’d do without them. They are the very essence of what it is to be a champion. 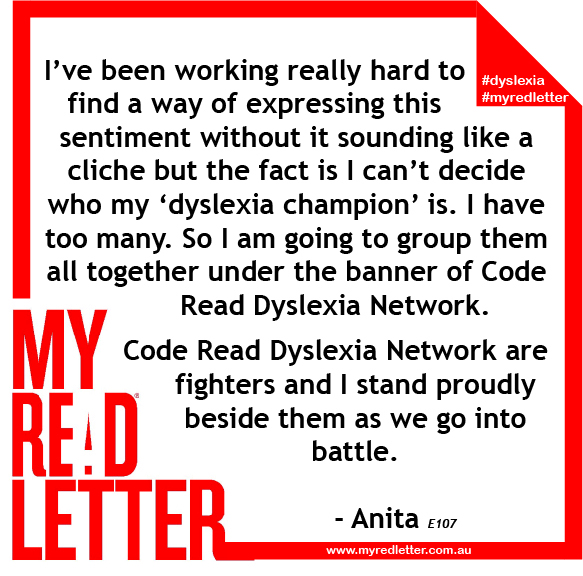 Code Read Dyslexia Network are fighters and I stand proudly beside them as we go into battle. 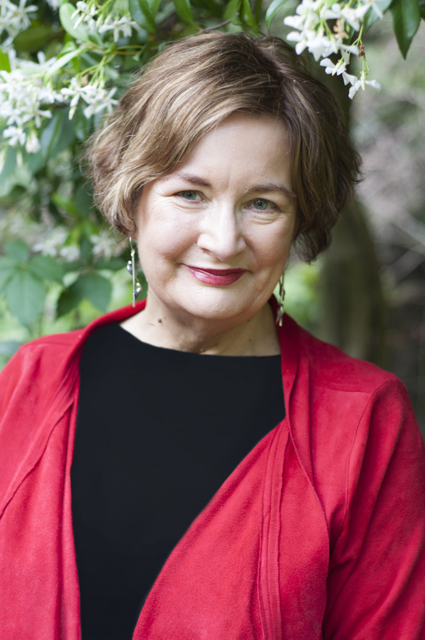 Anita - mother of a dyslexic child, wife of a dyslexic man child, Structured Literacy Therapist. My name is Evan and I am 11 years old. 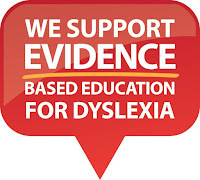 My dyslexia champion is my family. My family are my mum and dad. They help me when I don’t understand something and they take me to all the activities I enjoy. When I am sailing or doing karate I feel good about myself and it doesn’t matter that I am dyslexic.